Editor's note: Cornelius Adebahr is an associate at the Carnegie Endowment for International Peace, and author of Tehran Calling: Understanding a New Iranian Leadership. He taught political science at the University of Tehran in Iran from 2012 to 2013. The views expressed are his own. Iran may be continuing its global charm offensive, but the U.S. government is still having trouble selling changes in Iran policy to an American audience. The latest example came late last month, following Iranian President Hassan Rouhani's trip to Davos, Switzerland. During his appearances at the World Economic Forum, Rouhani invited gathered world and corporate leaders to take advantage of the opportunities that the opening up of Iran offers. But such encouragement is only likely to provoke ire in Washington, a point underscored just days later when U.S. Undersecretary of State Wendy Sherman was grilled by the Foreign Relations Committee over fears that the foreign firms lining up to do business with Iran could diminish Washington's leverage in negotiations over Iran's nuclear program. It's a compelling argument on the surface. But it is also one that belies a misunderstanding of the reality on the ground – and how the situation is viewed from within Iran. "Most of these delegations appear to be going to get themselves in line for the day when, in fact, a comprehensive agreement is reached, if it is reached," Bloomberg quoted Sherman as saying. "And we have told them all they are putting their reputations, themselves and their business enterprises at risk if they jump the gun." But the idea that business should continue to hold back for political reasons is not only unviable, but could be counterproductive. Indeed, insisting that Iran is still not open for business suggests that many policymakers in the United States are underestimating the importance of communicating properly in this conflict, especially towards an Iranian public yearning for signs that their economic lot is close to improving. International firms flocking to Iran are preparing for the moment sanctions are properly lifted. Yet rather than undermine the U.S. position, preparatory activities are actually raising expectations among business people and the broader public in Iran that there is light at the end of the tunnel. Such optimism could also help bolster Rouhani's standing vis-à-vis his hardline opponents, who have been sharply critical of a deal with the United States. Ultimately, the debate over Iran's nuclear program is about the perception of who is right or wrong, and the U.S. must make sure it stays on the right side of that debate. True, a robust sanctions regime has contributed to getting Iran to the table. But it is hard to imagine continuing international backing for tough measures if the U.S. and its allies don't alter their approach as Iran shows signs of compromise. Indeed, the notion that the current level of pressure should be extended indefinitely (or even increased if some U.S. politicians ever get their way) is misguided. Now that at least a minimum level of trust has been established through direct talks among foreign ministers and the conclusion of an interim agreement, the rest of the world is now looking toward some kind of resolution. But even setting aside political principle, it is clear that in practical terms, the hardline approach has not been quite as effective in discouraging Western business in Iran as some might have hoped. Anyone who has spent time in Tehran, even before Rouhani's election, will have noted the apparently healthy supply of Western products, from Coca-Cola to iPhones – all a testament to the creativity of companies able to do business legally in a country under sanctions. Indeed, American companies, rather than sitting on their hands when it comes to Iran's 70 million consumers, have been surprisingly active. They may not send official delegations but, through intermediary agents, many firms are actively seeking out investment opportunities in sectors ranging from chemicals to oil to food. Of course, many remain sympathetic to the frustration of U.S. policymakers over the urge of companies, European and American alike, to do business with a country that they still consider a grave threat to international peace. But if things go awry, these firms will have the luxury of being able to wait for the situation to improve. 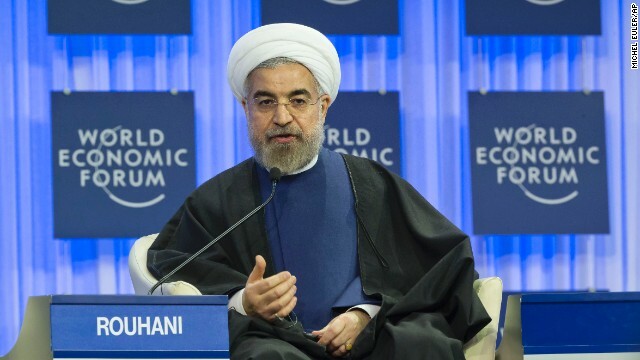 Iranian businesses – and Rouhani's government – may not be in quite so comfortable a position. Western comapanies doing business with Iran is truly a great idea all the way around. This could very well put a crimp into U.S. bullying that country and allow Iran to prosper once again. I truly agree with Cornelius Adebahr above. Cornelius Adebar might be right. He had lived in Tehran and seen Western goods available despite sanctions. Well, the Revolutionary Guard is said to run much of the businesses in Iran. They might have a finger in the pie, that Western goods be "smuggled" into the country. Indeed, the Revolutionary Guard and members of the ruling elite belong to those, who oppose the interim deal and negotiations with the West, because these hardliners don't suffer under the sanctions like ordinary Iranians. sources? or did you invent this tidbit like most of your other "facts". Except its Israel doing the bullying not the US. He does not know the Mullah that all are liar. They changed the tactic , because the Ahmadi nejad tactic failed and they switched to the new policy. Talking and pretending that they gave up about the bomb to get rid of sanctions, but keep all their atomic facilities safe like Parchin site that they did some nuclear explosion test and never permitted any visiting. Are the Iranian Mullahs any worse than the right-wing thugs in Washington, Mark? Somehow I don't think so! Iranian Mullahs wanted to be in the power and capture all Iranian wealth with ignoring human rights for Iranian people and doing dictatorship inside of Iran and also getting bomb to control the middle east. They welcoming the European bankrupt companies and promising them a big profit to get their support for removing sanctions. Mark is a nice name but what is your Persian name ? The charlatans are the one who imposed the sanctions in the first place under false excuses. If west don't let their business community to start talking now they will lose it to Asia. Iran regime is Terrorist center for training and also keeping them safe to send them all over the region. A senior al-Qaeda figure with close ties to the terrorist group’s current leader has left Iran, where he had lived for years after fleeing American forces in Afghanistan in 2001, according to former and current U.S. intelligence officials. Thirwat Shihata is the latest terrorist suspect to leave Iran, raising questions about the country’s motives for allowing or forcing the departure of a string of al-Qaeda members that it had sheltered over the past decade. U.S. officials said that Shihata, a 53-year-old Egyptian, was the deputy of Ayman al-Zawahiri, al-Qaeda’s current leader, when he ran Egyptian Islamic Jihad before it formally joined forces with Osama bin Laden in 1998. I see you are an expert in copy and paste. You have no idea what you are talking about. Quoting the rag-sheet WP does not give you credibility. Al Qaeda is a mortal enemy of Iran. Can you slow down a little bit , stop cut and pasting your always ready response to any article about Iran no mater what the subject is. fox news and Israel's almost angel leaders do a good job of informing the world about Iran they don't need your help . The US Congress just want to be fifth wheel in the negotiations. They have no positive input just a drag. Think about it, if foreign companies flock to Iran, it raises the expectations both within Iran and outside to come to a negotiated deal. Is that a bad thing? What have we learned from Cuba? Sanctions by themselves don't bring about change. The regime and their cohorts always survive, it is the people who suffer. So if you want a more open society in the long run, you need to be on the side of the people, not the other way around. Well said, Amin. Thank you. The politics of hunger needs to be outlawed at the UN once and for all! Agree with this article. What really pizzes me off is this; who the hell is US to say if Iran is open for business or not? Imagine anothe country says US is not open for business because they say so. Obama's 'advisors' are the same loonies who 'advised' carter that Khomeini was a saint and that the shah was a monster.....and we see how they were so wrong!!!! Well, actually the largest population of prisoners in the world is in the USA. Almost 1% of the American people are in prison, the highest incarceration rate in the world. So, please don't talk about Iranian dungeons. The dungeons are in Guantanamo, American prisons and foreign hell-holes operated by the CIA. Thank you, George. I couldn't have said it better! Well said @ George! And the tragic part of that is many havent even been CHARGED with a crime, much less tried and sentenced! How the he!! can that happen is beyond me. And furthermore....it is OUR hard earned tax dollars footing the bill! Iranian people are extremely proud. The very existence of the US is a slap in the face to them. That's why you see their president talk about "being humiliated" by the US. Anything more powerful than them is humiliating since it contradicts their religion which says they ought to be dominating the world. They will always seek the destruction of the US just for this reason, their pride won't let them accept being second best. Furthermore, Iran's news system is fully controlled by the government, by a few people who hate the US. This is similar to any dictatorship, Iranian people are continually being fed hate messages against the West. Years of this hate propaganda have made the Iranian people extremely angry at the US, which accomplishes nothing except to further the divide between us. The people of Iran have never heard one single good news story about the US in their entire lives, and the blame for that is on their leaders who are controlling their news. I have never read so much garbage in my life. Do you have a brain? Iranians are indeed proud of their history but where did you get the stupid idea that they want to dominate the world? Iran hasn't attacked another country since 1729. Do you know how many countries the U.S. has attacked just in the last 50 years? Lmao @ George, you rock!!! Another common sense moment right? And im sure if the Washington warmongers have their way we will be in another one very soon. I watched McCains interview tonite and im quite sure if he has his way we will be into it soon with Syria! Khamenehii Supreme leader of Iran told today: We will not get any agreement with 5 + 1 (because we do not give up the bomb), but negotiating is fine (because we try to get rid of sanctions)!! Please stop lying. He said nothing of the kind. He said that he is not optimistic, but he won't object to negotiations. Sometimes @ George, ya just gotta consider the source. In this case the source is someone who has alot of hate to spread around. And yea most likely an un~informed tool! Best to ignore him and maybe he will grow tired of talking to his self! But, others may believe him. This was such an obvious lie that it had to be corrected.